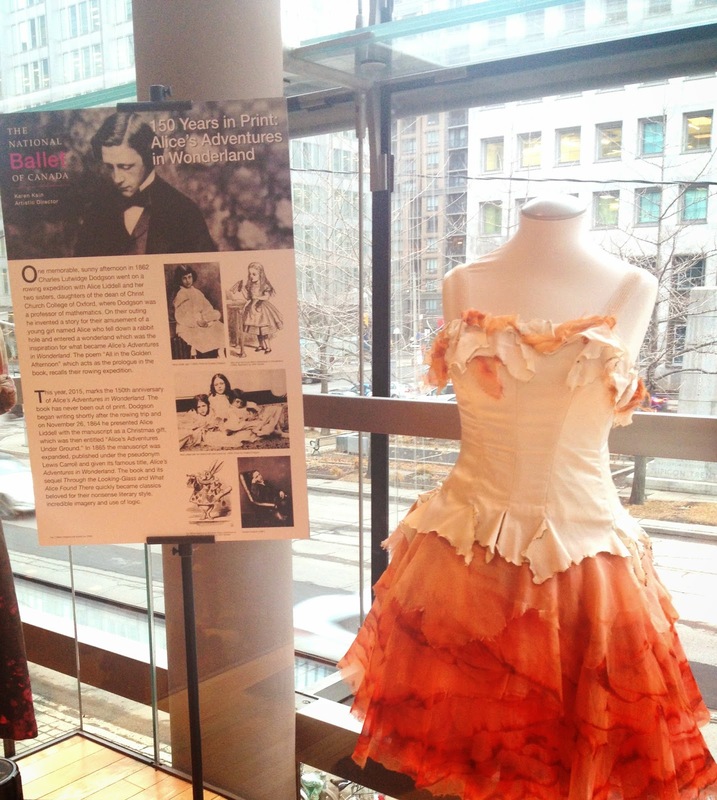 Last week I attended to National Ballet of Canada’s production of Alice’s Adventures in Wonderland. It was the most magical ballet I have seen to date. I had been waiting over a year to see the ballet, since the 2014/2015 season had been released. I adore seeing the ballet, as a dancer myself, I love watching professionals and gain so much inspiration from the time and effort they put into their bodies, technique and memorization of a full ballet. 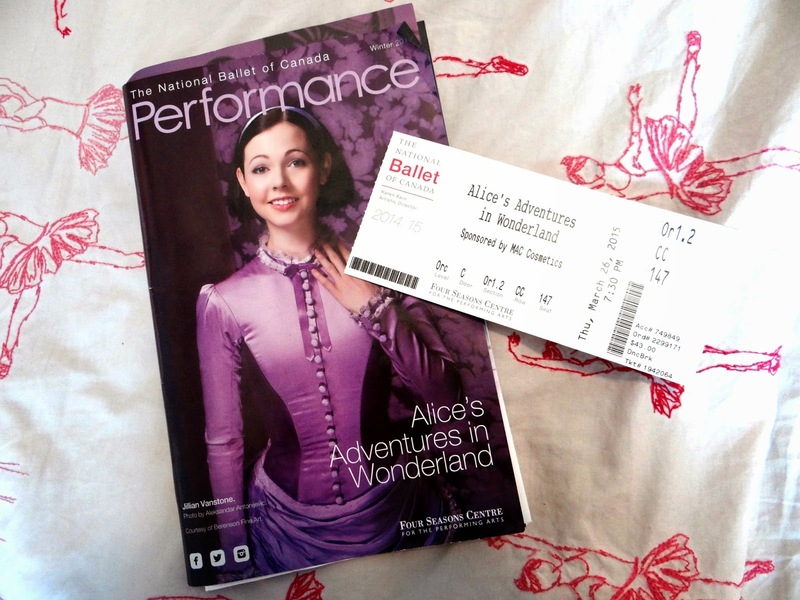 I have always been a huge fan of the story and history of Alice in Wonderland and loved seeing it come to life as a ballet. Tanya Howard who played Alice was an absolute vision. Both the White Rabbit and Queen of Hearts were cheeky crowd pleasers. The concept was incredibly well thought out. So much evident creativity went into reproducing Alice’s spiral down the rabbit hole, or drowning in her own tears. To produce the optical illusion of Alice having grown too large for the room, Howard crawled into a small cutout in the back drop of the set. The style of dance itself, while primarily classical ballet was infused with elements of contemporary and modern. It was so fitting as it enabled Howard to emulate Alice’s quirky personality. The choreography also borrowed from Indian Bollywood style dance to embody the slinking caterpillar. I also really enjoyed the tap dancing Mad Hatter, despite never having been very enthusiastic about tap dance and never had any interest in pursuing it myself, having studied a huge repertoire of dance. The whimsy of the original story was captured throughout the magical production, including confetti falling from the ceiling as the flowers danced into the audience. As well as the painting of white roses red. At one point the cards all toppled over themselves…in the most elegant ballerina fashion of course. The costumes were all fantastic. The Mad Hatter wore striped trousers, accompanied by hot pink wavy locks. The cards consisted of ladies donning tutus made up of flat hearts, spades, clovers and diamonds, which displayed when they bent over in a second position. Every single moment and set of the ballet was absolutely wonderful. I know I could see the ballet a million times and still be enchanted by something I missed prior. Unfortunately the ballet has now concluded, I look forward to the coming performances and release of future seasons. If you’re between the ages of eighteen and twenty-nine you are eligible for the Dance Break program. This allows adults under the age of thirty to purchase tickets the day of the performance at a reduced price. Tickets in the orchestra and grand ring are marked down to $45, with higher rings available at $35. This was the second time I’ve taken advantage of this wonderful opportunity. My cousin and I were seated in the orchestra section. I was absolutely thrilled as I’ve never had tickets so close before. I’m so grateful for the National Ballet of Canada for making this available to Toronto’s young adults. I know similar options are available for the Toronto Opera and Toronto Symphony Orchestra as well, which I’d like to take advantage of in the future. If you’re a young Ontarian with a passion for the arts it’s definitely worth looking into.